a whole and stress the unique capability of the ensemble to synthesize and realize new sonic territories. But more important, these improvised segments offer an inclusive, peaceful common ground for the many diverse musical cultures, past and present, obviously, enriched by these influences. Mixed by Kevin Schinstock at Mavericks Studio. Mastered by Alex DeTurk at Strange Weather. Recorded live at Roulette, New York City. Audio Engineering by Kevin Schinstock, assisted by Alain Paradis. Mixed by Kevin Schinstock and Alain Paradis at Mavericks Studio. Mastered by Alex DeTurk at Strange Weather. Recorded at Mavericks Studio, New York City. The SLM Ensemble is a New York City based experimental music large ensemble created by co-artistic directors bassist/composer Mark Dresser and conductor/composer Sarah Weaver. The SLM Ensemble was formed in 2014 from years of New York and international projects since 2007, Dresser and Weaver’s online collaborations, and longer term collaborations among the musicians, including concerts at The Stone, Roulette, Iridium Jazz Club, BMCC Tribeca Performing Arts Center, Austrian Cultural Forum, New York University, United Nations Headquarters in New York, and telematic concerts with Abu Dhabi, Banff, Beijing, Belfast, Jerusalem, Nairobi, San Diego, South Korea, Stanford, Stony Brook, and Switzerland. 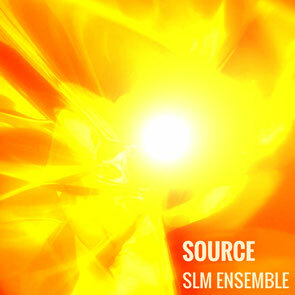 The SLM Ensemble continues this work at the forefront of experimental music, expressing synthesis of the innovative improvisation languages of the musicians, the diverse intersections within the ensemble, and forging new realizations for interconnection.